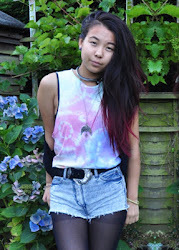 Here is what I would style with my dip-dye top and denim shirt. It is quite a summery outfit, as I was in the mood for it. I wish it was warm enough to wear this - darn British weather. 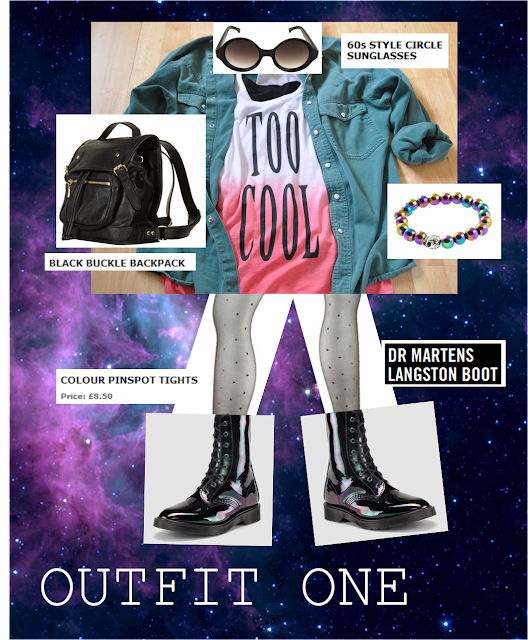 Thus, instead I decided to just lay the outfit out on the floor and take pictures. This is really not my style at the moment, nor am I really that content with it, but oh well - here it is. Top: from the "Teens" section of New Look for £9.99 - all the clothes there are pretty much the same as the adult section, but far cheaper, due to less tax. If you are size 10 or smaller, they actually have some good trendy clothes there. I love how it says "too cool", because that's just so me, obviously. Black Bandeau underneath as the arm holes for the top are quite long. Denim shirt: from a Vintage shop in Camden for £15 - I really like how this shirt is teal/green colour, instead of the average indigo denim, since I have so many items that are that colour now. It's quite oversized, but I like it like that, as it covers the bum, and by rolling the sleaves up, a bit more shape is given, so it doesn't look like you're being swallowed by your clothes. Once the weather is warmer, I look forward to wearing it as a jacket. Lacey leggings: not sure where this is from - I wouldn't normally wear this with it, as I think it makes the outfit too girly, but I have nothing else to wear with it. Shoes I wouldn't pair with it. Here are 2 pairs of lace up brogues probably wouldn't wear with this outfit, but I have no other shoes which would go. Brown leather brogues: from Marks and Spencers. I hate wearing brown and black together, so this is why I wouldn't wear with it. Floral brogues: from River Island. Too much pattern going on, if I wore this and my lace leggings. Obviously I wouldn't wear all 3 of these acessories together, but here are some different options. I think that the outfit above is okay, but I think that my own personal style has changed, and is no longer as girly. Here is what I would chose to wear if the world was my oyster. I don't know about you, but I personally think the Dr Martens Langsten boots are the most ridiculously awesome shoes to ever be designed. I love how it is shiny and is "petrol" coloured. The bracelet also matches the boots so yay. I like being matchy matchy. I was going to do an outfit two, but outfit one has taken me long enough!